This venue is situated in Kingston upon Thames. The nearest mainline station is Norbiton. Chancellors Halls of Residence has 5 blocks. Blocks A, B and C are joined. Blocks D and E are separate buildings. Access to all blocks is gained with a key card which is issued to resident students only. You are on Parking (F). Skip to the next section. The dimensions of the designated parking bay(s) are 350cm x 560cm (11ft 6in x 18ft 4in). The nearest parking to the halls is in Car Park F, although this is for staff and visitors only with a valid parking permit. You are on Outside Access (Block D Entrance). Skip to the next section. You are on Level Change (Block D Entrance). Skip to the next section. Access into this entrance is with a key card only. You are on Outside Access (Blocks A, B and C Entrances). Skip to the next section. You are on Level Change (Blocks A, B and C Entrances). Skip to the next section. You are on Outside Access (Block E Entrance). Skip to the next section. You are on Level Change (Block E Entrance). Skip to the next section. The ramp or slope is located at the entrance. You are on Outside Access (the Halls Management Office). Skip to the next section. The Halls Management office is located in front of the Walkden Halls. The Walkden Halls are located on the access road leading to Car Park F, adjacent to Block D.
You are on Reception (Halls Management Office). Skip to the next section. The reception desk is 1m (3ft 3in) from the front entrance. 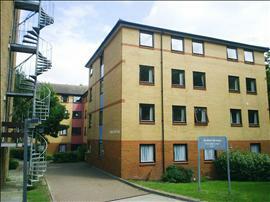 The Halls Management office is responsible for all Halls of Residence at Kingston Hill. The services on the floors which are not accessible are additional rooms. Each block has identical staircases leading to the same number of floors. You are on Lift (Block D). Skip to the next section. The lift is located in the foyer of Block D.
The lift is 5m (16ft 5in) from accessible entrance. The dimensions of the lift are 80cm x 140cm (2ft 7in x 4ft 7in). Block D is the only building with a lift, access to other floors in all other Chancellors buildings is via stairs only. 10 room(s) have been adapted for students with wheelchairs. The height of the bed is 50cm (1ft 7in). The measurement between the bed and the floor is 30cm. The adapted rooms do have en-suite facilities. The dimensions of the en-suite are 1.9m x 2m (6ft 2in x 6ft 6in). There is a functional emergency alarm fitted. The toilet roll holder is 50cm (1ft 7in) from the ground. As you face the toilet pan lateral transfer is to the left. The lateral transfer is 130cm (4ft 3in). The basin is 75cm (2ft 5in) from the ground. The toilet seat is 45cm (1ft 5in) above floor level. Lever taps are fitted to the hand basin. There is a roll in shower. The shower controls are 90cm (2ft 11in) from ground level. Twist / turn shower controls are used. Mirrors are placed at a lower level or angled for ease of use. As you face the toilet grab rails are on both the left and the right. The contrast between walls and floors is good. There are 2 rooms available on the ground floor of each block adapted for wheelchair users. Blocks A and D also have adapted kitchens available. One of each of the adapted rooms are available for students with a visual or hearing impairment. There is also 1 room in Blocks A, B, C and D that has been adapted for students with a hearing or visual impairment. The photograph shows the en-suite facility located in one of the rooms adapted for wheelchair users. The photograph shows Block D.